Appearances are there to be ignored, for the biggest hearts may reside in the smallest and unlikeliest of creatures. Those who fail to look beyond the surface will never encounter true virtue - not in others and certainly not in themselves. Granted, it's fairly easy to overlook the defenders of Girdlegard unless you are constantly staring down at your feet. For thousands of years the dwarves have protected the lands of humans, elves, and magi from the onslaught of orcs and älfar. However, while the only two active dwarven clans (out of five in total) are being torn apart by scheming, the enemy grows stronger yet. Oblivious to all of this, Tungdil, the only dwarf living in a kingdom of men, sets out to deliver a package and to meet other members of his own race for the first time. Little does he know that his mission will end up sending him, almost literally, to hell and back with the fate of Girdlegard resting on his shoulders. Heard this one before? Probably; few writers attempt to break Tolkien's epic fantasy adventure, and that makes for some very repetitive reads. Personally, I grew up among dragons and fairies and don't really mind reading the same old story with a different cover. This somewhat masochistic practice makes chancing upon books that even slightly vary from the usual format all the more enjoyable - like Markus Heitz' The Dwarves, which I insistently avoided every time I browsed the Fantasy section in a bookshop.There was something off-putting about buying the first seven-hundred-page-long installation in a quintet when I have so many unread books on my own shelves. After the slow initial one hundred pages, however, I soon found myself unable to put the book down even at 2 a.m. to rest my tired eyes. Within three nights I had glided through the first novel in the series. Tungdil's story is narrated in a writing style which, although it be simple, has just the right amount of detail to draw you in and spark your imagination. Sally-Ann Spencer, who translated the book from its German original into English, did an excellent job at determining when a name or a moniker requires translation in order to be more descriptive to English readers (you can read more about that in her interview for Orbit). This, plus the little elements such as calling 'days' 'orbits', made my experience as a reader more enjoyable and breathed a bit more life into Girdlegard. More than merely putting a smile on my face, however, Heitz' sense of humour left me chuckling to myself in public. A people crafted by the fire and rock of the land is bound to have more than a few peculiar quirks, after all. Before you set yourselves up for a light-hearted read, I will warn you of the novel's tendency to stray from the path of high fantasy and into the depths of dark fantasy. You will spot Gothic elements in the form of the älfar, Heitz' own creations, who like to paint pictures with the skin and blood of their victims. Not only that, you will find that some of the deaths in the novel are ghastly enough to be compared to those in A Song of Ice and Fire. Most of the other fantastic elements fall into place: powerful guiding wizards, frightening evil orcs, exquisite elves, stubborn dwarves, an undead army, a dangerous quest, and a big heart residing in a tiny body forced to carry the weight of the world. For me, what truly stood out in The Dwarves was not the new races or the mix of different genres, but the very creatures whose name it carries. The dwarves of Girdlegard, though clearly derived from those of Tolkien (in case the spelling of the plural hasn't given that away), have a rich and colourful culture, and a history as old, in-depth, glorious and twisted by time and lies, as our own. No longer serving as props to emphasise the grace of Tolkien's better-loved sidekicks, the elves, they are free to tell the legends of the battles they've lost and the wars they've won. The interpersonal relationships they develop grow to include not only entire clans and magical races, but also the readers themselves. And, even if you don't find that any of the major characters in this book stand out as particularly amiable or inspiring, you must admit that the mixture of their mismatched personalities into a single party is quite charming. Gathering speed, the wagon reached the point where the tunnel took a sudden plunge. Its passengers held on tightly as the vehicle tipped over the edge and careened into the abyss. Ireheart wooped in excitement, Boëndal held on for dear life, Bavragor burst into song, and Goïmgar petitioned Vraccas, while Tungdil wondered if any of his companions were sane. Against my better judgement as a literary and linguistic scholar, I decided not to go for an academic review. Instead, this is more me sharing one of my many inspirations in life, in the hopes that some of you might enjoy it as well. Hopefully, there will be many more such posts to come. 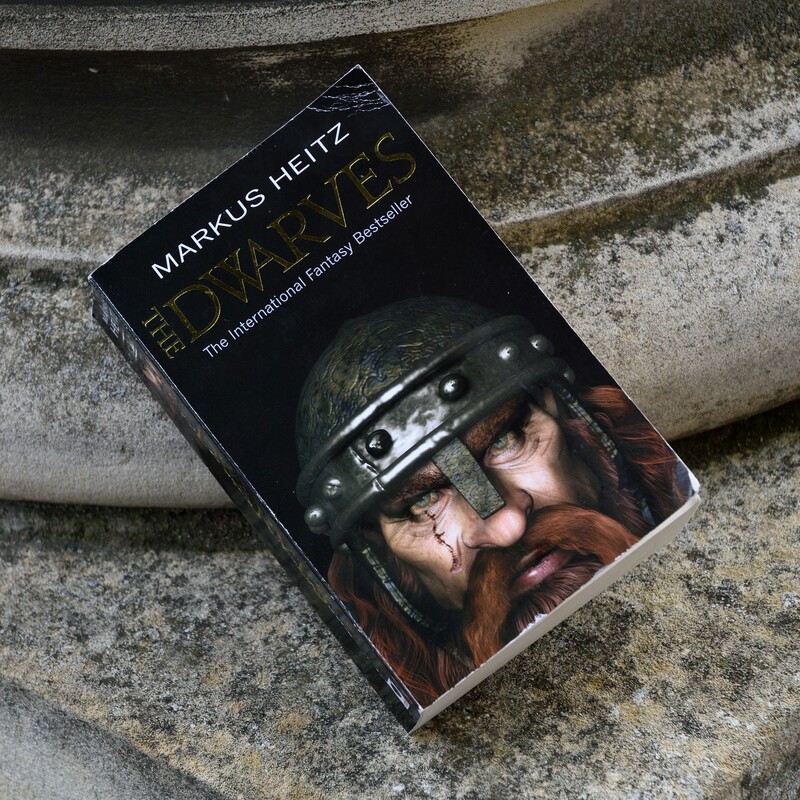 For now, I urge you to give this book a chance, as I have already started on the second novel in the series - War of the Dwarves. May your inner furnace burn strong.